A UV curable composition useful for three-dimensional inkjet printing comprising (i) at least one UV curable urethane (meth)acrylate resin; (ii) at least one wax; (iii) at least one (meth)acrylate diluent; (iv) at least one photoinitiator; and (v) at least one polymerization inhibitor; wherein the amount of wax (ii) is sufficient to phase change the UV curable composition after jetting. The urethane waxes used herein can either be inert urethane waxes or reactive urethane waxes that have one or more functional groups reactive with the aforementioned (meth)acrylate compounds (i), (iii) or (iv). One preferred class of inert linear urethane waxes has the chemical formula C 18H37NCOOCnH(2n+1) wherein n is an integer from 4 to 16. Another preferred class of reactive linear urethane waxes has the chemical formula CnH(2n+1)NC(O)OCmH(2m)OC(O)C(CH3)═CH2 wherein n is an integer from about 12 to about 18 and m is an integer from about 2 to about 12. Another preferred class of reactive urethane wax has the chemical formula CnH(2n+1)O(O)CNC2H4OOCC(CH3)═CH2 wherein n is an integer from about 4 to about 18. Preferably, the total amount of urethane wax in the UV curable composition is from about 5% to about 25% by weight. The most preferred urethane waxes are ADS038 [1-dodecyl-N-octadecyl carbamate: CH3(CH2)17NCOO(CH2)11CH3] and ADS043 [1-hexadecyl-N-octadecyl carbamate: CH3(CH2)17NCOO(CH2)15CH3] waxes available from American Dye Source, Inc. of Baie D'Urfe, Quebec, Canada. It is preferred that they be used in combination. Preferably, the freezing point of the urethane wax is greater than about 40° C. when in the UV curable composition. This facilitates planarization and layer height correction of the jetted materials. The present invention is further described in detail by means of the following Examples and Comparisons. All parts and percentages are by weight and all temperatures are degrees Celsius unless explicitly stated otherwise. Melting point ° C. 52° C. 55° C. 57° C. 56° C. 53° C.
Freezing point ° C. 46° C. 47.5° C. 50° C. 49.5° C. 45° C.
Melt/Freeze Temperature 58° C./49.5° C.
1. A UV curable composition useful for three-dimensional inkjet printing comprising (i) at least one UV curable urethane (meth)acrylate resin; (ii) at least one wax; (iii) at least one (meth)acrylate diluent; (iv) at least one photoinitiator; and (v) at least one polymerization inhibitor; wherein the amount of wax (ii) is sufficient to phase change the UV curable composition after jetting. 2. The composition of claim 1 wherein the (meth)acrylate resin is about 25% to about 70% by weight of the composition. 3. The composition of claim 1 wherein the wax is from about 5% to about 25% by weight of the composition. 4. The composition of claim 1 wherein the (meth)acrylate diluent is from about 10% to about 60% by weight of the composition. 5. The composition of claim 1 wherein the photoinitiator is from about 0.1% to about 5% by weight of the composition. 6. The composition of claim 1 wherein the polymerization inhibitor is from about 0.1% to about 1% by weight of the composition. 7. The composition of claim 1 having thermal stability of at least 3 days at 85° C.
8. The composition of claim 1 wherein the wax is a urethane wax. 9. The composition of claim 8 wherein the urethane wax is selected from the group consisting of compounds having the structure C18H37NCOOCnH(2n+1) wherein n is an integer from 4 to 16. 10. The composition of claim 8 wherein the wax has a freezing point greater than about 40° C. in the composition. 11. The composition of claim 1 having a viscosity between about 10 to about 16 cPs. 12. The composition of claim 8 wherein the urethane wax is a reactive urethane wax having the structure CnH(2n+1)NC(O)OCmH(2m)OC(O)C(CH3)═CH2 wherein n is an integer from about 12 to about 18 and m is an integer from about 2 to about 12. 14. The composition of claim 1 which optionally contains an epoxy acrylate. 15. The composition of claim 14 which optionally contains bis-phenol-A-di(meth)acrylate. 16. A UV curable composition useful for three-dimensional inkjet printing comprising (i) at least one UV curable urethane (meth)acrylate resin; (ii) at least one urethane wax; (iii) at least one (meth)acrylate diluent; (iv) at least one photoinitiator; and (v) at least one polymerization inhibitor. 17. The composition of claim 16 herein the (meth)acrylate resin is about 25% to about 70% by weight of the composition. 18. The composition of claim 16 wherein the urethane wax is from about 5% to about 25% by weight of the composition. 19. The composition of claim 16 wherein the (meth)acrylate diluent is from about 10% to about 60% by weight of the composition. 20. The composition of claim 16 wherein the photoinitiator is from about 0.1% to about 5% by weight of the composition. 21. The composition of claim 16 wherein the polymerization inhibitor is from about 0.1% to about 1% by weight of the composition. 22. The composition of claim 16 having thermal stability of at least 3 days at 85° C.
23. The composition of claim 16 wherein the urethane wax is selected from the group consisting of compounds having the structure C18H37NCOOCnH(2n+1) wherein n is an integer from 4 to 16. 24. The composition of claim 16 wherein the urethane wax has a freezing point greater than about 40° C. in the composition. 25. The composition of claim 16 having a viscosity between about 10 to about 16 cPs. 26. The composition of claim 16 wherein the urethane wax is a reactive urethane wax having the structure CnH(2n+1)NC(O)OCmH(2m)OC(O)C(CH3)═CH2 wherein n is an integer from about 12 to about 18 and m is an integer from about 2 to about 12. 27. The composition of claim 16 wherein the urethane wax is a reactive urethane wax of the structure CnH(2n+1)O(O)CNC2H4OOCC(CH3)═CH2 wherein n is an integer from about 4 to about 18. 28. 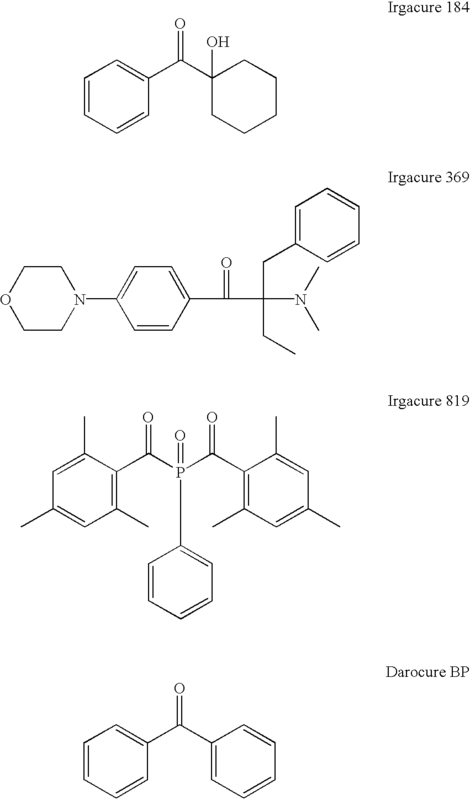 A UV curable composition useful for three-dimensional inkjet printing comprising (i) about 25% to 70% by weight of at least one (meth)acrylate oligomer resin; (ii) about 5% to about 25% by weight of at least one urethane wax; (iii) about 10% to about 60% by weight of at least one (meth)acrylate diluent; (iv) about 0.1% to about 5% by weight of at least one photoinitiator; and (v) about 0.1% to about 1% by weight of at least one polymerization inhibitor; all percentages by weight are based on the total weight of the composition. wherein the amount of material to be deposited corresponds to the area selected for said printing effects and the height of the raised area relative to the medium on which said composition is deposited. 30. A method according to claim 29 wherein said step of depositing comprises the step of jetting the UV light curable composition. 31. A method according to claim 29 wherein said step of depositing comprises the step of selectively adjusting the output from each of a plurality of ink-jet nozzles, to control the amount of material dispensed from each nozzle. g) repeating steps d), e), and f) to form subsequent layers until at least said portion of the object is formed. 33. The method of claim 32 wherein step d) is accomplished by jetting the composition through at least one jet head. 34. The method of claim 32 further comprising correcting the thickness of at least one layer prior to curing the material by planarizing the dispensed material to remove excess material and create a uniformly smooth exposed surface. DE3677527D1 (en) 1985-11-20 1991-03-21 Mead Corp Ionic dyes as initiators containing photosensitive materials.